Manhattan's Lab Gallery, the gallery that cancelled artist Cosimo Cavallaro's exhibition of the controversial and naked 'Chocolate Jesus', has dropped its plans for showing another work by the same artist. "'Peep Mohammed' turned out to be far more controversial than 'Chocolate Jesus'", said the gallery's creative director, Matt Semler. "Whereas Christians and Catholics simply protested 'Chocolate Jesus', the Muslims have threatened to kill, torture and decapitate us if we go forward with 'Peep Mohammed'. So we dropped all plans for its premiere exhibition," he said. The object of art, a Marshmallow Peep in the likeness of Mohammed seated in a chocolate half-shell, caused an uproar in the Muslim community which insists that there be no image, likeness or representation of the prophet. 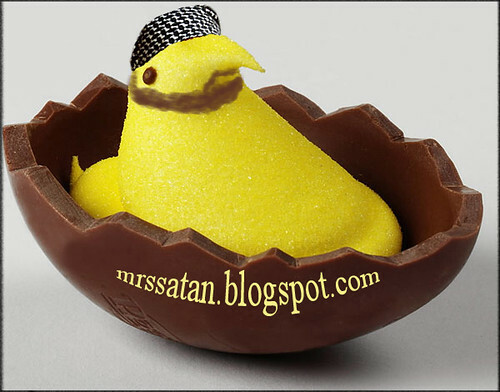 "Peep Mohammed is blasphemy," said Cleric Baba al-Baba al-Habeeb. "Even though the museum has capitulated to our demands we still will make every effort to hurt, maim and kill those connected to this offense because we are the religion of peace," he said. Fatwa! You will continue making funny stuff like this -- or else. May the fleas of a thousand camels infest your jockstrap Infidel!! Ahhh, Terry...that is one of my most favorite fetishes. I'm getting excited just thinking about it.